We have specialized in Cabinet Refinishing in Portland, OR for years. You could also say we perform Cabinet Refacing in Portland, OR. Or sometimes it is called Cabinet Resurfacing. No matter what you call it, the results are astonishing. This is the process of making your old or outdated kitchen cabinets look like new again without replacing them. Kitchen Cabinet Renewal can save you $1000's over replacement and is usually ready to use in less than 12 hours, compared to one or more weeks of renovation to replace your kitchen cabinets. Choosing the right company to refinish your cabinets can save you time, frustration and money. Choosing the wrong company can make your life miserable. Renew-It Refinishing offers three different types of cabinet refinishing to fit every need and budget. Want to know Cabinet Refinishing Costs? We offer free estimates on Cabinet Refacing in Portland, OR. 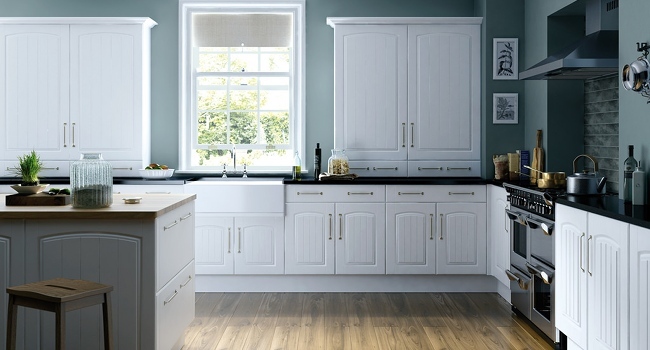 We can even offer some great ideas to make your kitchen cabinets look like new without replacement. We offer Basic, Deluxe and our Best Cabinet Refinishing. You choose which one is best for you. Our Basic Cabinet Refinishing comes with a 1 Year No-Peel Warranty and is a perfectly respectable and durable cabinet refinishing service for those on a budget or for those who aren't interested in a long cabinet refinishing warranty. Our Deluxe Cabinet Refacing comes with a 5 Year No-Peel Warranty and is a great tub refinishing service for those who want an even more durable, more glossy surface, and for those who want the comfort of a 5 Year Cabinet Refacing No-Peel Warranty. Our Best Cabinet Resurfacing comes with Portland, Oregon's only Lifetime No-Peel Warranty and is the absolute best cabinet refinishing process available in Portland, OR Guaranteed. Our Best Cabinet Refinishing receives a thorough etching and bonding agent to ensure decades of beauty. It receives at least 5 coats of durable, high quality cabinet refinishing materials to ensure a rock hard surface that cannot peel. Our Best Cabinet Refinishing process is truly the absolute best cabinet & grout refinishing available in Portland Guaranteed! And boasts the only Lifetime No-Peel Cabinet Refinishing Warranty in Portland, OR. Why Not Just Install New Kitchen Cabinets? Many people in Portland OR decide that refacing kitchen cabinets is better than replacing them for at least two reasons. Time and Expense. Time - Installing new kitchen cabinets is a lot more involved than just refacing kitchen cabinets Portland. First, the old cabinets must be removed which creates a huge mess. This may reveal other issues that must be addressed before the kitchen cabinets can be reinstalled. Then, the new kitchen cabinets must be installed. If you choose to go this route, please make sure you choose a quality contractor or you may be creating more problems for yourself. Expense - Replacing your old, dated and worn kitchen cabinets instead of refinishing old cabinets can easily cost thousands of dollars. [$5,000-$20,000 average kitchen cabinet replacement cost in Portland, OR] Refinishing your cabinets can save you as much as 80% compared to replacement. Refinishing is an inexpensive alternative to replacing your old kitchen cabinets. If you decide that refacing cabinets in Portland is your best option, please call us for a Free Consultation and Written Estimate. We will explain your options and give you a written estimate. Or if you already have an estimate from another company, we will give you a free Second Opinion. We can refinish your kitchen cabinets to a color of your choice giving you a like new look, without the cost and time involved in replacing cabinets. Call us today to get more information. Why would I consider refacing my old kitchen cabinets? There are many reasons to choose a cabinet refinishing service. You may have unsightly scratches or worn areas on your cabinets from daily use. You may want to update the color to something new and exciting. You may be selling your home and don't want to replace slightly damaged or worn cabinets and refinishing it is an inexpensive alternative to replacement. You may be remodeling your kitchen and replacing the cabinets is not an option due to budget, space or some other reason. Whatever your reason for wanting to refinish you cabinets, Renew-It Cabinet Refinishing can help. Contact Us here for a free, in-home consultation. How to choose the right cabinet refinishing service? We certainly hope that you will choose Renew-It Refinishing for all of your refinishing needs. But we realize that there are many cabinet refinishing companies in Portland OR and that you want to make sure that you are choosing the best one. So, here are a few tips. As with any service company, the longer a cabinet refinishing company has been in business, the bigger his reputation with the local community. Either for the good or the bad. Reading Client Testimonials really helps when searching for a cabinet refinishing service in Portland OR. Allow his clients to fill you in on their experience. Make sure whomever you choose has a great reputation. Also make sure that he is fully covered by insurance. There are some real horror stories of contractors who are not covered with the proper insurance causing big problems and leaving the homeowner with the bill because they were not properly covered. Bonding and licensing is also important. By the way, Renew-It Refinishing has all of this and more. Check out our great Guarantees here that no other cabinet refinishing contractor in Portland is brave enough to put in writing. 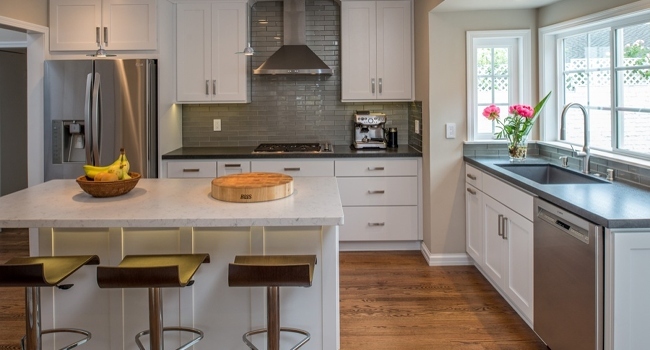 What type of cabinet refacing do we offer in Portland? There are many different methods of cabinet refinishing to choose from in Portland OR. We use different methods depending on your needs. The finished product often looks the same, but the preparation is vastly different depending on the surface we are refinishing. Some cabinet surfaces simply require a cleaning and clear coat to make them shine like new. Others require deep etching and honing to remove deep scratches or pitting before they can be refinished. Either way, Renew-It Refinishing has the best process for refinishing your cabinet . What about chips repairs in old cabinets? Chip repairs are typically covered in the price of a standard refinishing job. We scrape and sand all the rough edges to prepare the surface for our repair materials. Then we carefully fill and sand the surface to prepare for the new coatings. Missing doors can be replaced before refinishing and made to match the existing cabinets. Our chip repairs are undetectable. What kind of cabinet refacing warranty will I get? We offer three different warranties based on your needs. Our Basic Cabinet Refinishing process comes with a one year no-peel warranty. Our Deluxe Cabinet Refinishing comes with a five year no-peel warranty. Our Best Cabinet Refinishing comes with Portland's only Lifetime No-Peel Warranty. This costs a little extra, but ensures that you are covered if the surface ever starts to peel. How soon can I use my refinished cabinets? 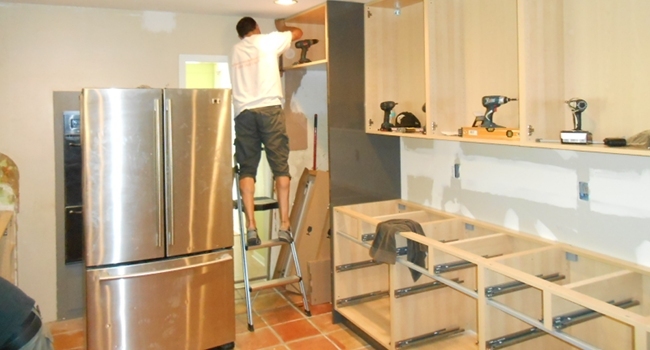 Depending on the process you choose, your cabinet could be ready to use within a few hours. We recommend waiting up to 12 hours to ensure that the surface is completely cured and ready for use though. Using your newly refinished cabinet too soon could void your warranty and lead to costly repairs. It pays to wait. Search no more for Kitchen Cabinet Refacing near me. Portland OR is home to Renew-It Refinishing. Renew-It has been refinishing and refacing kitchen cabinets for years with 100% satisfaction. We have tons of 5 Star Reviews on Google for you to research us. We have a A+ Rating with the BBB [Better Business Bureau]. We are determined to make everyone of our great clients happy. We deliver quality workmanship using only the best kitchen cabinet refacing materials. We do not offer DIY Cabinet Refinishing services. We have pictures of kitchen cabinet refacing near you to show our beautiful work. We are ready to make you happy by giving you a new kitchen cabinet experience. Imagine making your old tired kitchen look like new in just a couple days. We will prepare everything and clean up so your home looks just as nice when we leave, as it did when we arrived. We guarantee you will be happy with our Kitchen Cabinet Refacing Services in Portland OR.